The capture of Ehud Goldwasser and Eldad Regev on 12th July 2006 sparked the 34-day conflict known as the 2006 Israel-Hezbollah War. Goldwasser’s wife Karnit and her two-year campaign to find information about her missing husband is the focus of this short documentary that at its best is quite moving and insightful, but suffers from bizarre editing choices and incredibly annoying sound design that substantially reduce the impact of the film. Chronicles of a Kidnap is at its best when exploring the effect on those who remain of not knowing the fate of their loved one. How should one react? What demands can a citizen make of her government? And what can the response of a responsible government be? When is it long enough and time to ‘let go’? In eloquent vignettes, Karnit Goldwasser and her family and acquaintances describe the effect of living with such unknowns, forming an overall narrative that demonstrates significant insight. 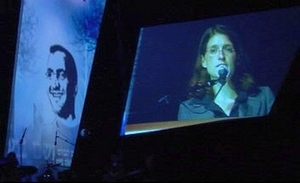 Goldwasser obtained incredible access to world leaders during her campaign, and the viewer is witness to meetings with French President Nicolas Sarkozy and Israeli Prime Minister Shimon Peres. Her meeting with Peres is instructive in that director Nurit Kedar is able to show clearly the inability of the Israeli leadership to provide comfort, with the unfortunate Prime Minister often left with only silence as his response to Goldwasser’s questions. It is most unfortunate, then, that these moving and insightful interviews are intercut with footage taken with a helmet camera on a bicycle ride along a rocky mountain path – these point-of-view shots are supposed to convey meaning for Kedar, and yet they make whole sections of the film almost unwatchable. The shooting style also contributes to a sense that the filmmaker wants to tell her audience how to feel, with extreme close-ups favoured for many of the interview subjects, making their testimony seem all the more personal. It is, however, somewhat tiring to be subjected constantly to such shots, and one may be forgiven for longing for a better appreciation of the subjects’ body language and physicality. Finally, the sound design features rather intrusive music and sound effects that frequently distract one from the vision. This has the effect of reducing the impact of the emotional journey of the subjects, and this surely can not have been the filmmaker’s intention. The subjects have painful and remarkable stories to tell, and it is unfortunate that they are often buried under layers of artifice. Nonetheless, Chronicle of a Kidnap makes enough of Karnit Goldwasser’s struggle to remain a moving film, and has the good sense to keep the focus at the personal level and avoid discussion of the greater Israeli-Arab conflict.